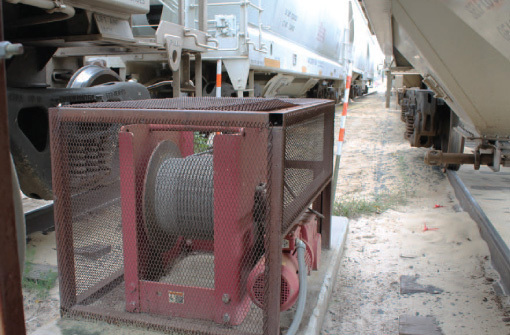 RailCar Positioning Winches - Bulk Material Handling | Thern, Inc. Heavy-duty and fully customizable electric winches provide powerful operation up to 40 tons for positioning railcars at loading terminals, rail yards, and sidetracks. Thern power winches provide the power and control needed for dependable handling of heavy loads. Thern provided a 4HPF40M-S7 pulling winch and a 4HS11M-S14 take-up winch for pulling and positioning railcars for Wisconsin Industrial Sand Co. The pulling winch has a 40,000 lb. capacity for positioning railcars under the load-out chutes in the loading process. Thern’s single-winch solution provided terminal operators with the heavy-duty load capacity they required, at a fraction of the cost of conventional methods. A dual cable anchor design provided a closed loop system, which allowed the winch to move the railcars in two directions with the high level of load control needed for this application.